“The world would be a better place without religion.” A statement spoken with as much vehemence as frequency of late, and largely in response to the IS terror campaign. What does a Christian gal say to such hostility? How does she respond when her faith is muddled with all the other myriad religions and their disparate gods and motivations? She groans inwardly, I can tell you that, and she is saddened that the owners of these statements don’t try to understand her beliefs – a faith free of religion. 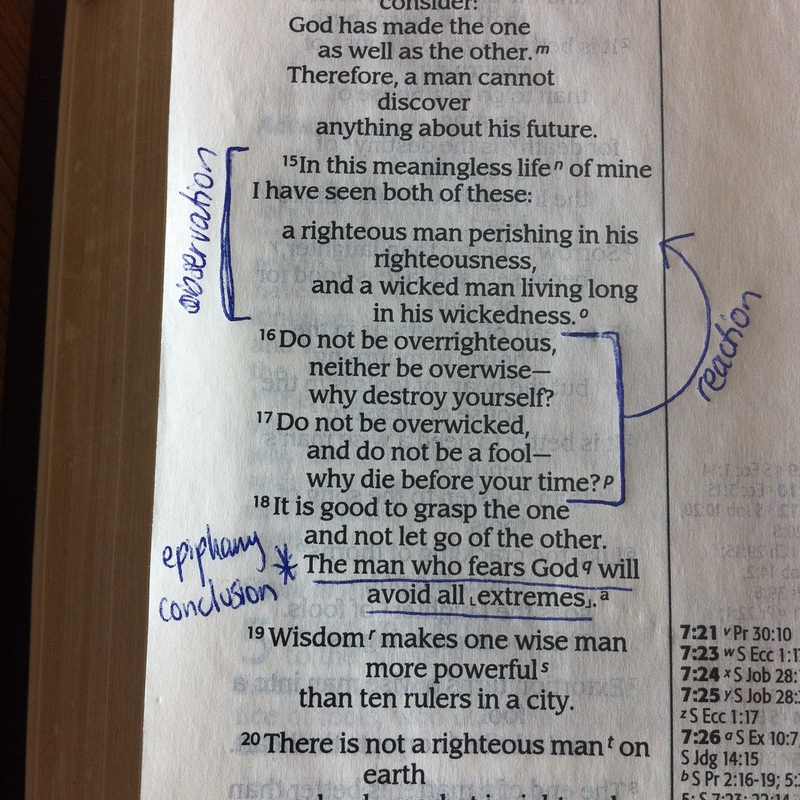 In attempting to read a little of the Bible every day this year, I came to Ecclesiastes, believed to have been written by Solomon who is well-known for his writings on wisdom. I hear you, Solomon. The world is unchanged on that front. There’s a library of commentary on these verses and little wonder. It’s easy to find implication that we can be too good or too wise. Perhaps even that it’s okay to be a little bit wicked! Delve deeper – read the verses over and over – and they start to sound like an inward conversation. An observation and a response. Let’s call the main characters of this script Truth and Extremist. Truth admits that life is unfair. She points to children dying at the hands of abusive parents. She reveals news reports of war atrocities, natural disasters and good people drawing their last breath in the pursuit of justice. She allows a peak into the lives of corrupt leaders building their palaces with blood and wickedness so their reign is long and lavish. He pursues perfection by scrutinising his faith religiously – stripping it of love and relationship so that all that’s left is a long list of laws. He hopes to earn a good life. Or, he acknowledges that perfection is unattainable and gives up on faith to be immersed in the thrill of uninhibited sensory pleasures, however temporary. Life’s short. Enjoy it while it lasts. Whoever hooks their extremist ideologies on the Christian faith should stick this verse on their fridge and ruminate. The whole point of Christianity, its very nucleus, is based on transcending religious, works-based redemption. That is, God doesn’t need us to do X amount of good deeds to qualify, or convert X number of people. He certainly doesn’t require us to kill all who refuse him. During the Sydney siege, terrorist Man Haron Monis displayed an Islamic flag in the window of the Lindt café in Martin Place. It was the Shahada flag. As I’m not in the habit of conferring terrorist messages, I’ll let you Google its meaning, if you’re so inclined. The display of this flag and the proceeding commentary got me thinking what a Christian flag might look like, if one sentence were emblazoned on silk to sum up what we’re about. It’s a radical transaction of love that requires no extremist activity whatsoever. First published in The Examiner Newspaper for Keeping the Faith column on Monday February 2, 2015. Thank you Claire for your wise understanding.